The Americans with Disabilities Act (ADA) is the widest-ranging piece of civil rights legislation ever passed in the history of the United States, and it has become the model for most civil rights laws around the world. The untold story behind the act is anything but a dry account of bills and speeches, however. Rather, it’s a fascinating story of how a group of leftist Berkeley hippies managed to make an alliance with upper-crust, conservative Republicans to bring about a truly bipartisan bill. 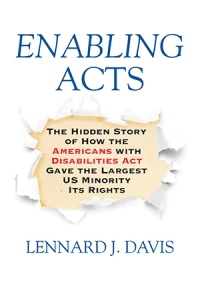 In this riveting account, acclaimed disability scholar Lennard J. Davis tells the behind-the-scenes and on-the-ground story of a too-often ignored or forgotten civil rights fight, while illustrating the successes and shortcomings of the ADA in areas ranging from employment, education, and transportation to shifting social attitudes. Published for the twenty-fifth anniversary of the ADA, this book promises to powerfully ignite readers in a discussion of disability rights in America.